Welcome to our home on Eutaw Place in Reservoir Hill, one of Baltimore's most historic neighborhoods. Please be our guest as you take a tour of our home and show you what it was like to live as our Victorian forefathers did over a hundred years ago. In the process you'll learn about how the Victorians designed their homes and why we have come to admire the precision engineering that went into building a Victorian Mansion and the beauty, comfort, and graciousness of living in one. 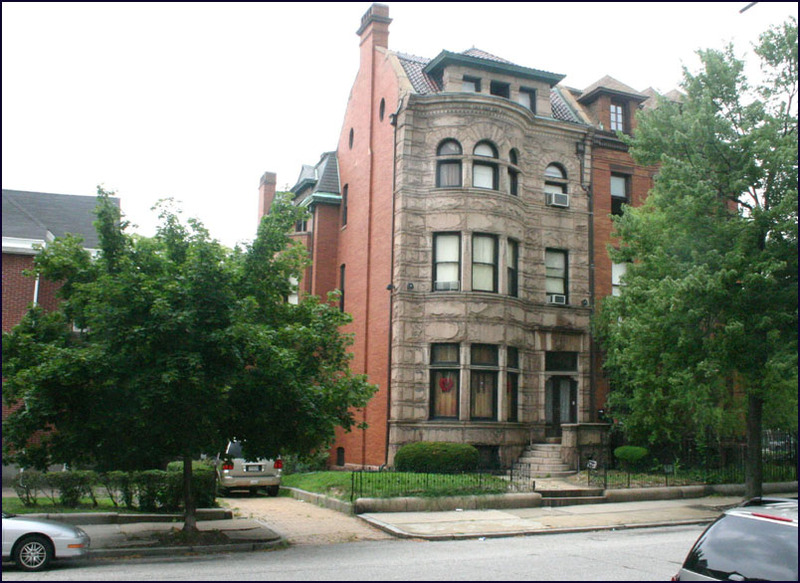 Our neighborhood, Reservoir Hill, is known for its beautiful Victorian architecture, large mansions, and close proximity to Druid Hill Park inaugurated by Baltimore Mayor Thomas Swann in 1860. At 745-acres, the park is one of the largest urban parks in America, about the same size as New York City's Central Park completed a few years later in 1873. The park has been a popular destination for city dwellers and features a number of attractions, including numerous Bronze statues, the Maryland Zoo and the recently renovated conservatory. 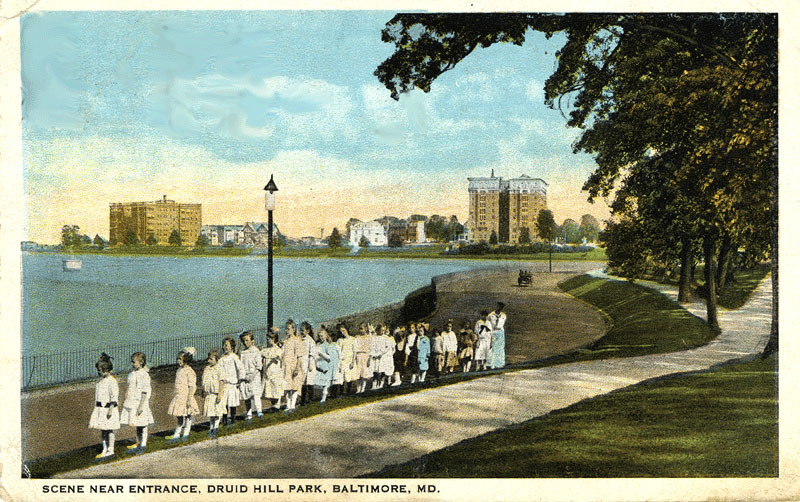 This post card taken inside Druid Hill Park looks across the reservoir at Reservoir Hill and was taken in 1919. In the early twentieth century Reservoir Hill was among Baltimore's most fashionable addresses. 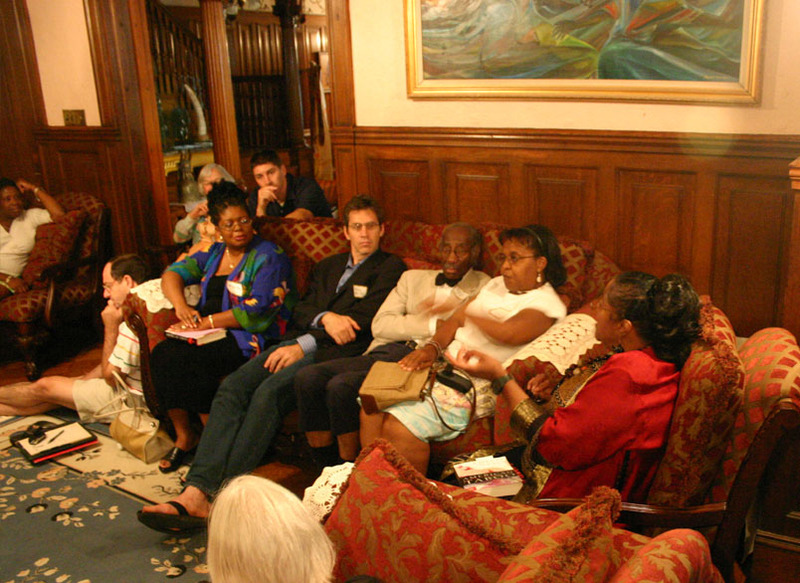 Its residents included the owners of Hecht's department stores (Their original home is two doors down from ours. ), Hochshild's department stores and the Hendlers, makers of ice cream. 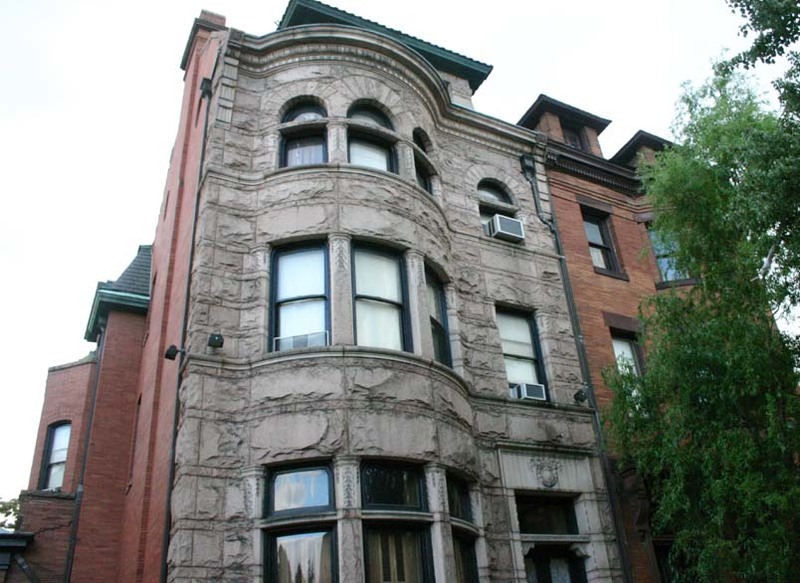 Jewish intellectuals like writer Gertrude Stein lived in Reservoir Hill while she attended Medical School at Johns Hopkins and Pulitzer Prize-winning poet Karl Shapiro called Reservoir Hill his home. 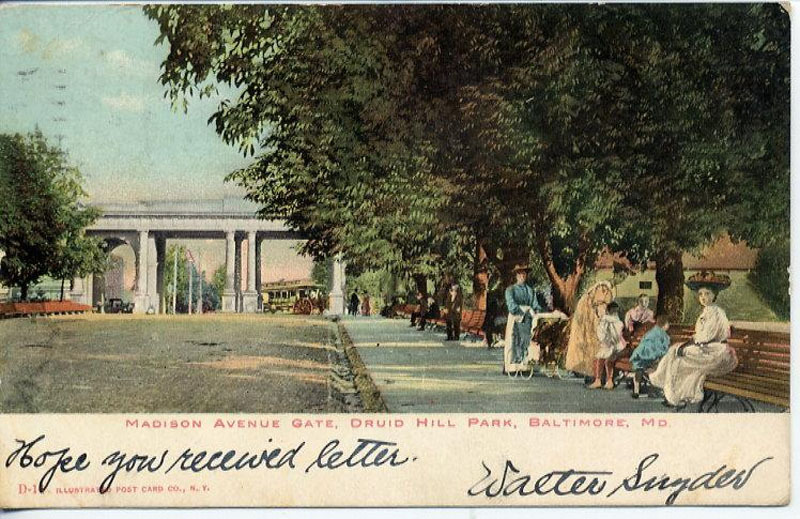 This postcard shows Madison Avenue (one block from our house) in 1907. At that time Reservoir Hill was served by streetcars like the one in the background coming under the entrance to the neighborhood. Most of the homes in Reservoir Hill are brownstones or row houses. 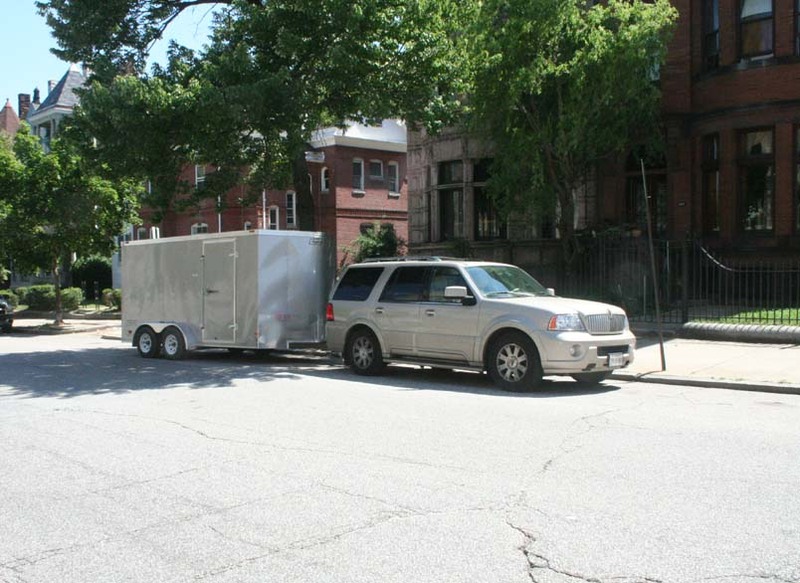 Our home on Eutaw Place (photographed above from the steps of Beth Am synagogue) is one of the few that was originally built as a free standing house and also one of the few that has it's own driveway with Porte Coche and detached garage. It is a one-of-a-kind, red Virginia Brick Mansion with five stories including attic and basement and over 12,000 square feet that can be can be divided into living space, library space, research space, or business space. It has been featured in "Baltimore" magazine and is considered one the most beautiful and well preserved examples of Victorian architecture in all of Baltimore. Builder N.C. Showacre erected the home with Granite facing in 1895 for John K. Snow, a shipping and coal magnate. 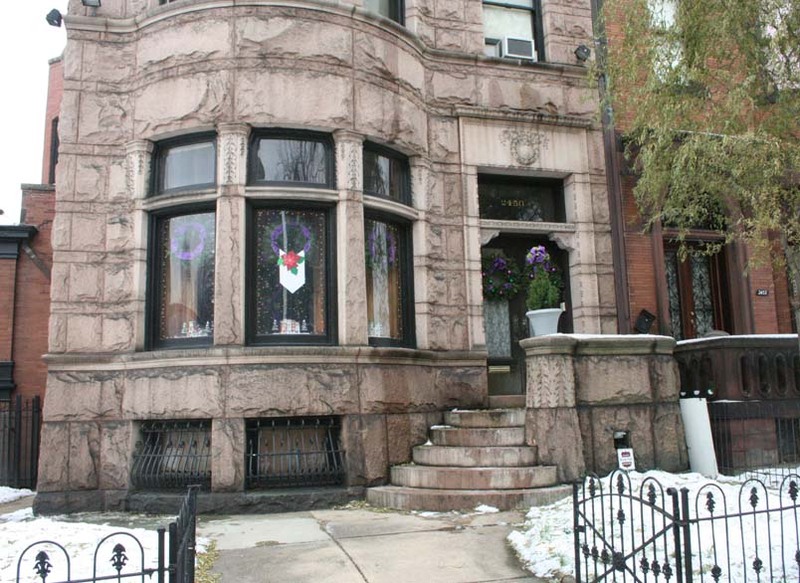 Our house was one of the first houses built in Reservoir Hill and is an excellent example of how the wealthy lived in the late 19th century before the exodus to the suburbs began in the early 1900s. Reservoir Hill probably has the largest concentration of high-style townhouses in the city. The architectural style of our house is considered Second Empire and can be recognized by the mansard roof and dormer windows. The windows on the left side of the house on the lower floor are called a bay windows. They direct more light into a room from three sides. Below the bay windows are windows into the basement. The house is ingeniously built into the side of a hill to provide drainage so that while the basement is below ground level at the front of the house, the back door to the basement leads out directly to the back yard and carriage house at the rear of the house. The house is filled with fine wood and architectural detail. As you enter, you are enveloped in a marble vestibule of matched marble tablets. The fleur de lis mosaic tile floor motif is carried out in a wood pattern on the vestibule doors. The vestibule is intended to not only provide a formal transition space between outside and inside, but has a more practical purpose functioning as an "air lock" to reduce the amount of air flow caused by opening an exterior door directly into a conditioned space. The window over the door is known as a fanlight. It helps bring more light into the long and dark entrance hallway. 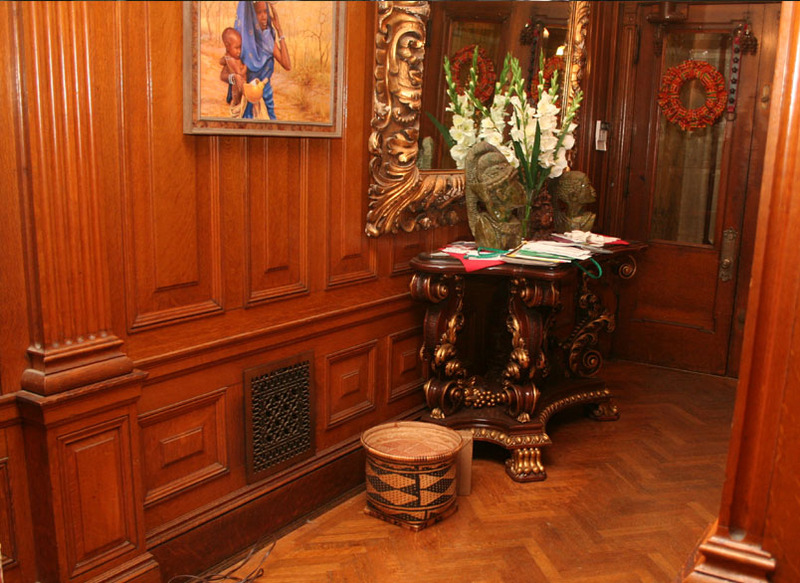 Once inside the foyer, you are greeted with cathedral type arches of exquisite Honduras mahogany wood columns and wainscoting with gingerbread accents over a herringbone floor. During the later years of the Victorian era, people started treating the foyer as a room in itself. Pieces of furniture graced this area where the family and visitors could hang their coats and hats. Most had mirrors to help the ladies and gentlemen adjust their hats. 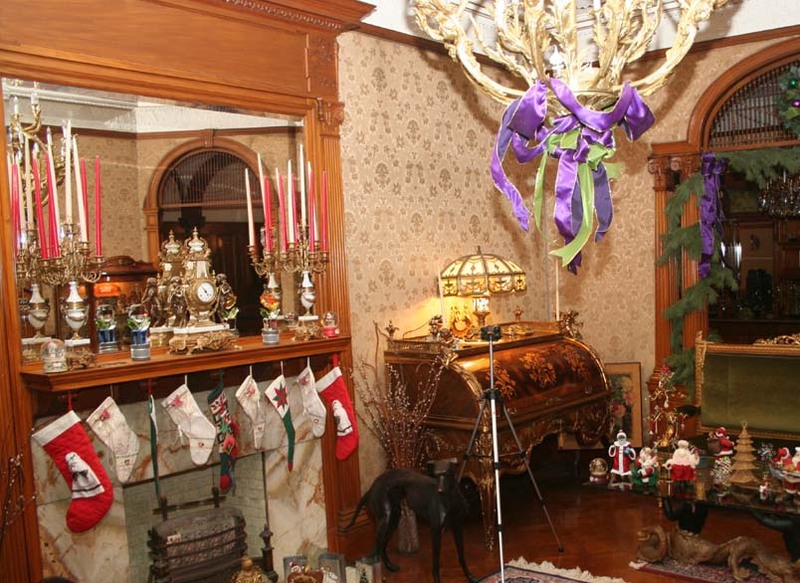 We are now looking at the same scene as the previous photo but through the pocket doors leading into the parlor or sitting room. 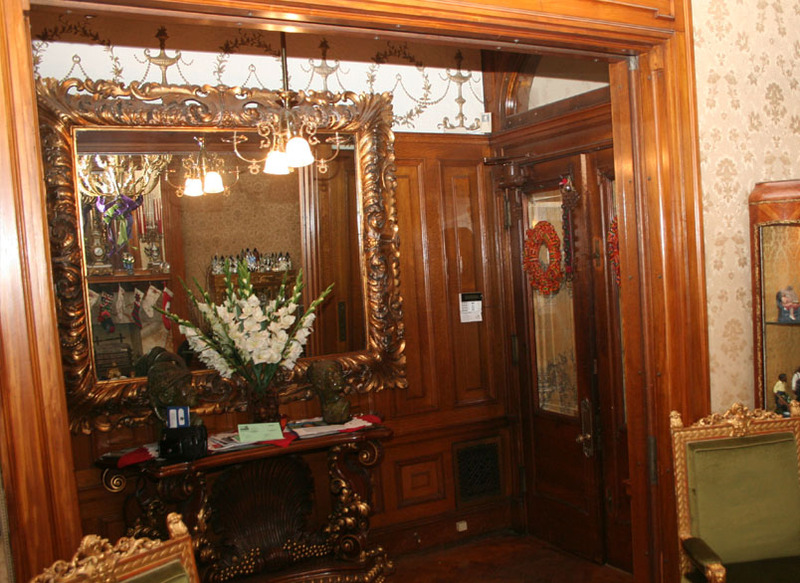 Victorians guarded their privacy jealously so the massive pocket doors in the center of the photo would normally be closed so that unexpected guests would be confined to the foyer. The pocket doors would be left open when guests were expected providing a welcoming entry into the parlor or sitting room. 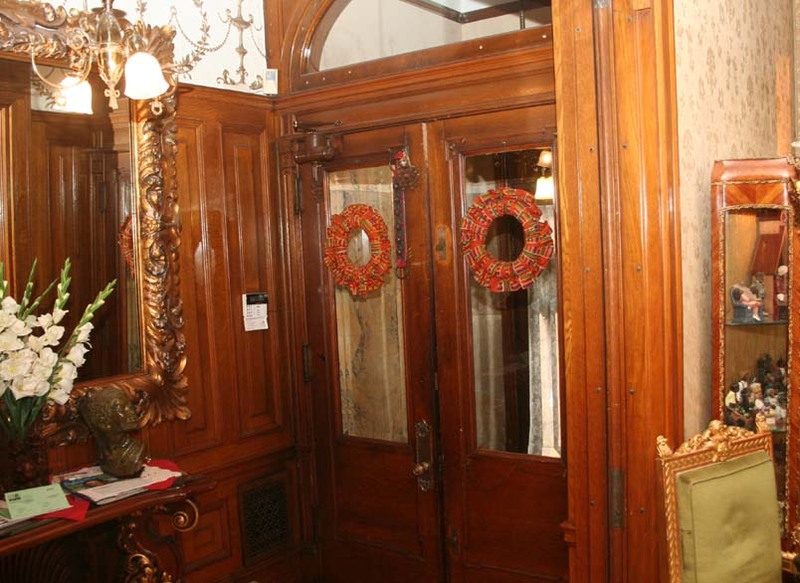 Pocket doors were very popular at the turn of the 20th century. They are very space efficient and do not take up the floor space that a regular door would need for opening and closing. The doors are supported by wheels that roll on tracks inside the walls and are so perfectly installed and balanced that even after over 100 years of use very little effort is required to close these pocket doors weighing hundreds of pounds. 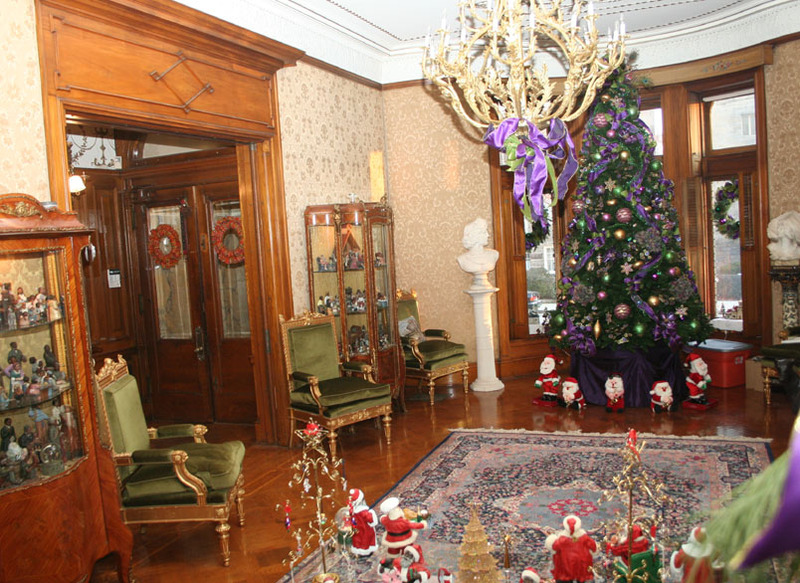 The parlor or sitting room was the showplace of the Victorian home. 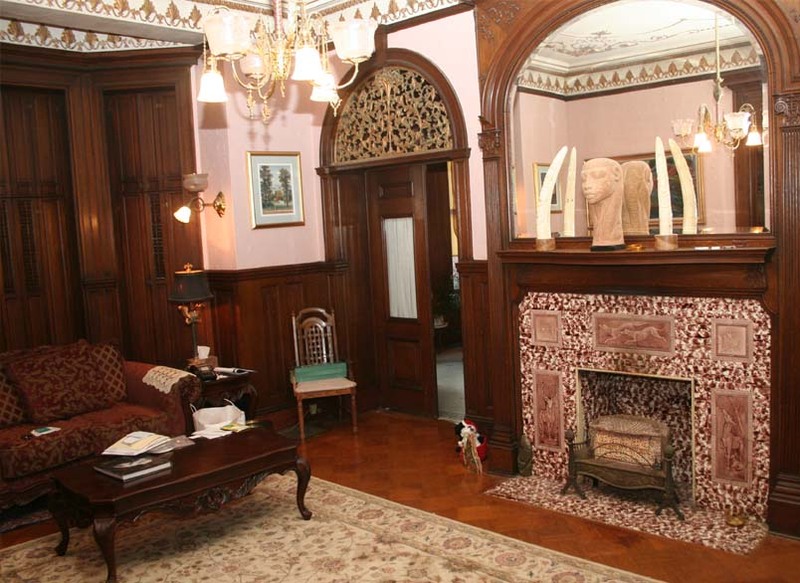 The Pocket doors open into the parlor to reveal a marble fireplace (one of seven) with a floor-to-ceiling mantle. 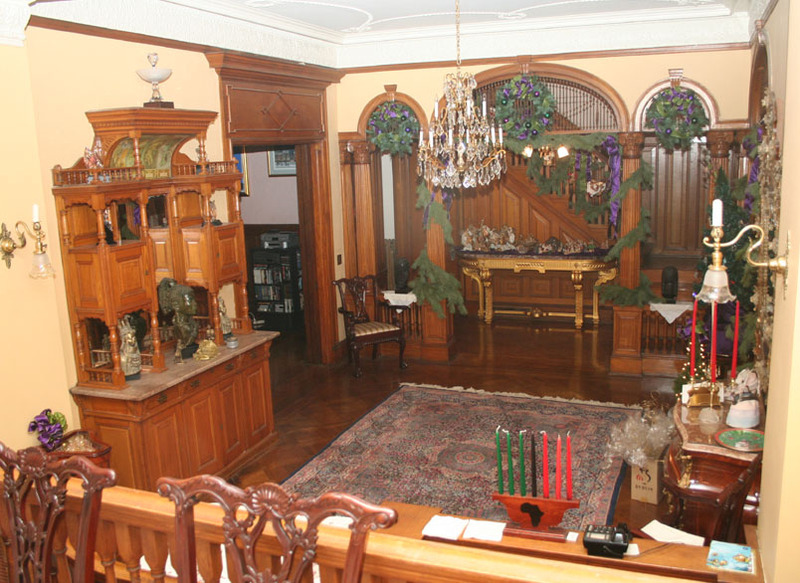 All seven mantle pieces are carved with beveled mirrors. The wall covering in the living room is adorned with Moire Taffeta. The Victorians covered their wall with paintings, prints and family portraits. On the mantle of the fireplace you might have seen wax flowers under glass domes. We are now standing in the dining room looking up at the music room which is several feet higher than the rest of the first floor. This is where the orchestra would sit to provide live music for parties. 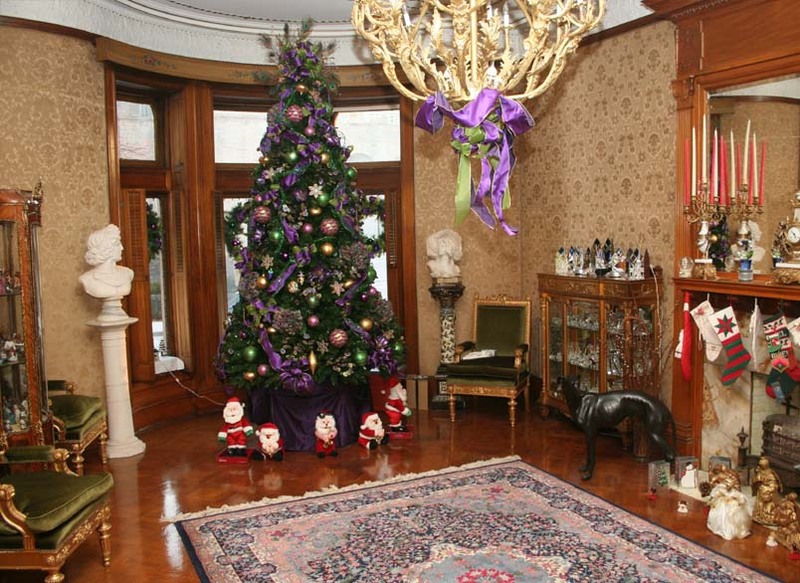 The music room was added by the second owner of the house, Frederick Bereschmidt, Baltimore's well-known "Beer Baron," who modified the house by adding the Porte Coche to the south that provided a driveway to the two story detached garage and side entrance to the house. The music room sits over the Porte Coche and the banister visible in the photo leads down to a side entrance to the house. At the time the Porte Coche was built automobiles were relatively rare and since there were no service stations the two story carriage house behind the main house featured it's own hand-operated gasoline pump, an underground tank for fuel (since removed), and an apartment for the driver/mechanic of the owner's "horseless carriage." We are now looking down into the dining room from the elevated stage of the music room. 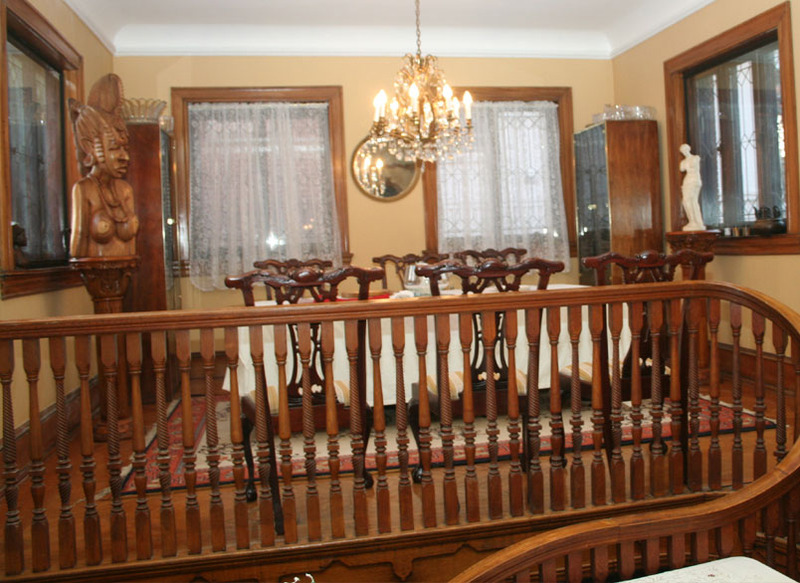 The most outstanding feature of a Victorian dining room like this one was the sideboard on the left. Although elaborately carved and heavily ornamented, the sideboard served a practical purpose. The family silverware and table linens were stored in its drawers. The “Sunday best” china and crystal glasses were put on display on its shelves. Even the mirrors on the sideboard served the useful purpose of reflecting light from the candelabra. The ceilings of the rooms on the first floor have plaster decorations that denote the purpose of the rooms. If you look closely you can see pictures of fruit and vegatables in the plaster decorations in the ceiling. The Victorians were masters of space and time. By closing the two sets of pocket doors on the first floor, the first floor can be divided into a living room, dining room, music room and family room - large but intimate areas for family or small groups. Opening all the pocket doors transforms the first floor into an large open space that can accomodate parties of up to 200 people. Once the pocket door is closed, our favorite room in the house is the family room. We have spent many a cold winter's night on the sofa watching our favorite movies by the light of the ornate tiled gas fireplace while our dogs lay in front of the fire soaking up the heat. There would normally be heavy velvet curtains hanging in front of the pocket windows behind the couch. The window hangings in Victorian homes were often very complex arrangements of two and three layers of cloth with an under curtain of lightweight fabric to allow light into the house during the day and outer-curtains that were drawn shut at night to afford privacy and to help eliminate cold drafts. 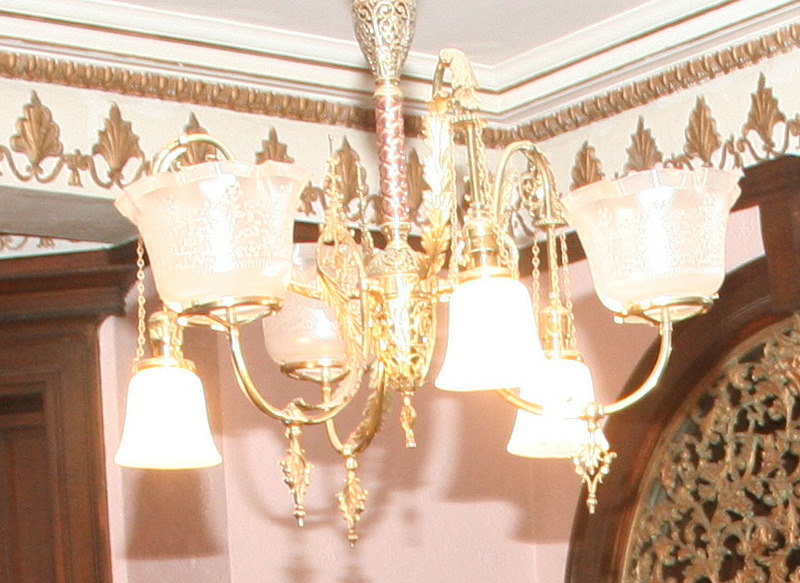 Many of the original lighting fixtures in our house are a combination of gas and electric, common in 1895. The gas electric period was very brief, beginning in the late 1890's and ending for the most part by 1905. Electricity was just being introduced into homes as a lighting and energy source; however, it was not yet reliable. 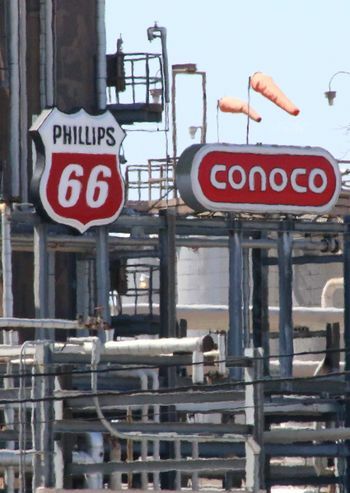 Lighting manufacturer's combined both gas and electric into one fixture. When the electric power failed the homeowner could turn on the gas portion of the light. The Victorians gave each floor a distinctive use. The first floor was the public area where guests were received and entertained. Once you go up the staircase to the second floor, you were in a private area only accessible to family and the closest friends. The third floor was servant's quarters and the attic was for storage of household goods. You will see one set of stairs on the right and a second set of stairs through the door. The stairs in the background are service stairs that lead from the kitchen and pantry to the second and third floors. These were used by the maid and butler and allowed them to go about their business while the owners were entertaining guests in the "public area" of the house. Life in a Victorian household was definitely "Upstairs, Downstairs." 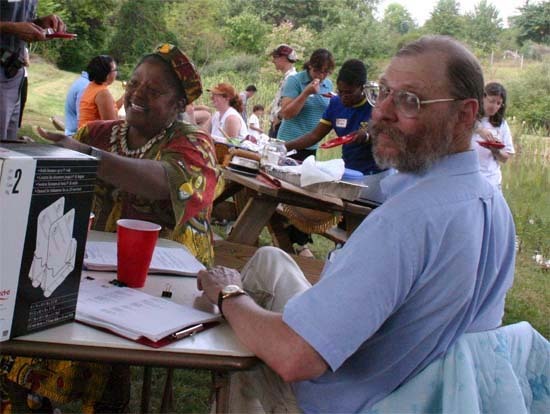 When I served in the Peace Corps 35 years ago one of the most interesting and rewarding aspects of the experience was the opportunity to speak the language, learn the music, poetry, and customs of my country of service, and to some extent "get inside the heads" of the people I was working with to understand the world through their point of view. Living in a Victorian house for twenty years and immersing ourselves in books and movies that portray Victorian life has allowed my wife and I a similar experience - a journey not in distance but in time. In our culture today, we think of ourselves as advanced and modern, but in the past few years my wife and I have come to admire many aspects of Victorian life, the moral code that they lived by, and the graciousness of sharing our Victorian home with family and friends. 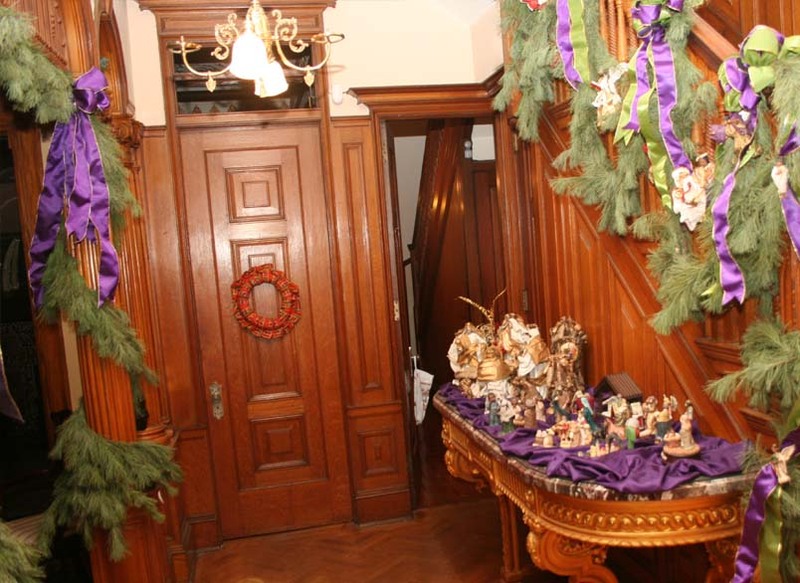 This completes the tour of the public area of our Victorian Mansion in Baltimore's Reservoir Hill although there is still much to see - the kitchen, the carriage house, the sun room, the walk-in silver safe, the library, the dressing room, nine guest bedrooms, and the Victorian bathrooms. We leave you in the living room looking out the three bay windows to Eutaw Place. We hope you have enjoyed your visit. Thank you for being our guest. All content on this web site is licensed under the Creative Commons under a Attribution-Noncommercial-Share Alike 2.0 Generic license and attribution must be provided to Hugh Pickens. Some content in this article may be presented without the permission of the copyright owner for the non-profit purposes of criticism, comment, education, scholarship, and research under the "Fair Use" provisions of U.S. Government copyright laws. This page was last modified on 6 April 2018, at 17:38.